In September last year, Audi presented with the Audi A1 Sportback the successor to the small car, which was released in 2010. The people from Ingolstadt have changed the design of the model series GB drastically compared to the predecessor. It appears now sportier and more dynamic. The three flat slots under the front bonnet should remain to the Audi sport quattro, which was presented at the IAA in 1983 and had been developed after the FIA-Homologation for the Group B of the Rallysport. 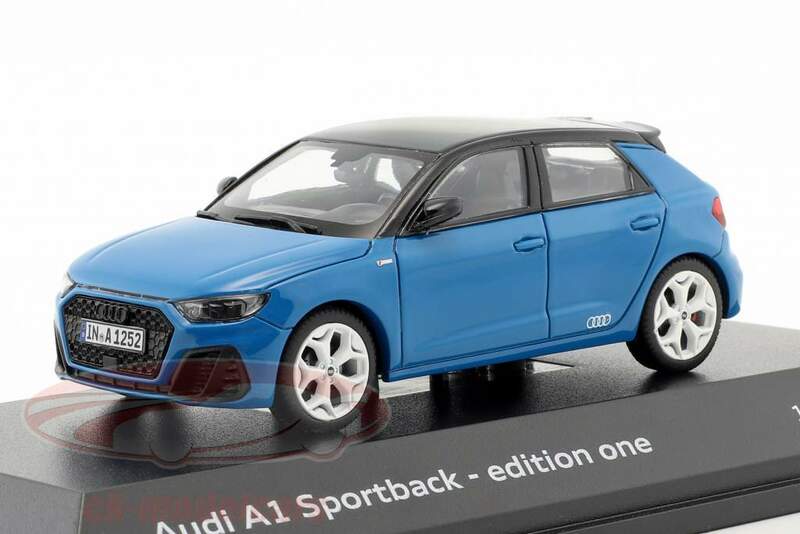 With this detail, Audi markes the motorsports affinity and wants to highlight the sportiness of the new A1. This can be also seen at the shaping of the front and rear bumper. Paragon met the details of the design of the five door car, compared to the role model very well. 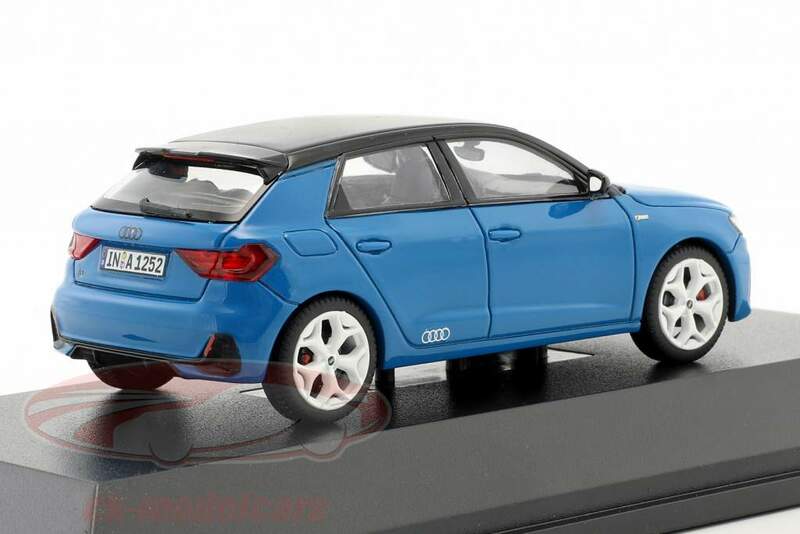 And there we are at the modelcars of the model series GB, which first have appeared from iScale in the color glacier white (5011801031) and now come a little bit upgraded: for example in the part of the rear spoiler in the color turbo blue. 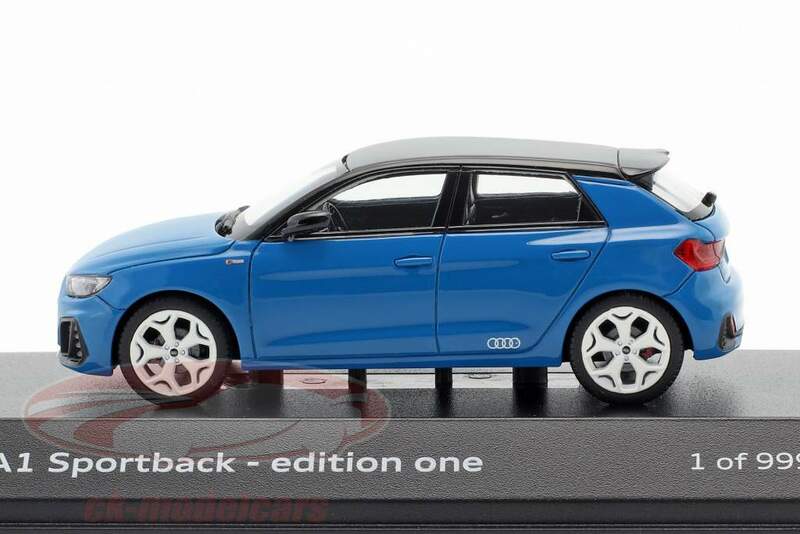 These miniatures of the so called Edition one are limited to 999 units and listed under the item number 5011811031. The role model of the Edition one is an A1 30 TFSI. The car is powered by an offshoot of the engine series VW EA211, which generates 85 kW / 116 PS out of three cylinders with about one liter capacity, one turbocharger and gasoline direct injection. All this pushes the front wheels. With a six speed manual or a seven speed S-Tronic transmission, the car scores 203 kilometers per hour. It takes 9,5 seconds to accelerate to 100. The motorization of the model series starts at 70 kW / 95 PS and includes also the four cylinder with 110 kW / 150 PS and 147 kW / 200 PS. The A1 evolved by 56 milimeters in length and messures now 4,03 meters. At the same time the width stayed the same with 1,74 meters. The hight amounts to 1,41 meters on the new generation - with antenna its about 1,43 meters. Audi intends the new A1 Sportback as a perfect companion for the urban environment but also as very suitable to drive for long distances. With its infotainment and driving safety systems, the car should play in the upper class level, so Audi. We see good models, which should not be missed in any collection concerning the brand with the four rings.